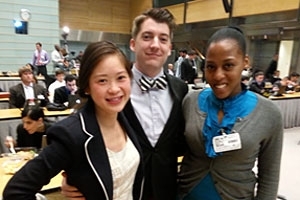 Amanda Liu, BA '13, left, with her H2O teammates, Brad Kerley of the University of Memphis and Markita Minor of Newberry College, at the Athgo Global Forum. Four Kogod students, including one who won a $2,000 grant for her startup idea, recently attended a social entrepreneurship conference hosted at the World Bank headquarters in Washington, D.C.
How can social entrepreneurs make a difference in the world? What role will technology have in these changes? These were the questions at the heart of the Athgo Global Innovation Forum. For three days, they joined more than 100 other students from around the world, heard speeches from industry CEOs, networked with international leaders in social entrepreneurship, and participated in a startup development competition. "We heard so many people speak about so many interesting ideas and projects," said Bh Jamison, BSBA '13. "It really got my mind spinning and looking into fields I hadn't considered before." Jamison attended the conference with three classmates from Executive-in-Residence Robert Sicina's Peace Through Commerce practicum, which is aimed at entrepreneurship in conflict regions. At the start of the conference, the participants were divided into randomly assigned teams to work on a startup idea. Teams were given time during the three-day conference to brainstorm a social development project with a technological angle to pitch to the panelists on the final day. Amanda Liu, an SIS '13 graduate with an international business minor from Kogod, led her team to a second place finish, earning the Entrepreneur Grant of $2,000 from Athgo to get the project off the ground. Liu and her teammates, Brad Kerley of the University of Memphis and Markita Minor of Newberry College, will use their winnings to get their company, H2O, and product, H2Oasis, off the ground. "The beauty of our product lies in its simplicity," Liu said. "We were inspired by the earthquake in Haiti and the need for clean water in disaster areas." H2Oasis is a self-contained water filtration system housed in an ordinary shipping container. Liu and her partners plan to team with relief organizations to mobilize the containers to areas in need, allowing them to focus H2O's time and resources on outfitting units. "We realized early on that we needed to focus on harnessing the skills we have," Liu said. "We're not a delivery service, we don't know the first thing about getting supplies to disaster areas but that's where partnering with a group better at something than you comes into play, and that's a big part of what the conference was about." Meeting successful social entrepreneurs served as confirmation that the students are on the right path and that they are not alone in their interests. "It was really great to meet and work with so many other like-minded people my age," said Gabriela Siem, BSBA/BA '14. "These are the people who will be making a difference in my generation." For Erik Payn, BSBA '13, many of the speakers and panelists' insights served as a road map. "It was so inspirational to learn how these people that I want to be like in 15 years got where they are," he said. The conference only added fuel to the fire of Payn's existing entrepreneurial drive—the recent graduate is already pursuing two startup ideas. "I've known for a while now that I wanted to go in an entrepreneurial direction, which isn't something most people expect from someone my age," he said. "Lots of people say it's a field only for older, very experienced workers so it was really comforting to hear confirmation that yes, young people can start their own businesses and they can succeed at it."